1.27.2”Lx19.8”W inches. Lighted with fiber optics. 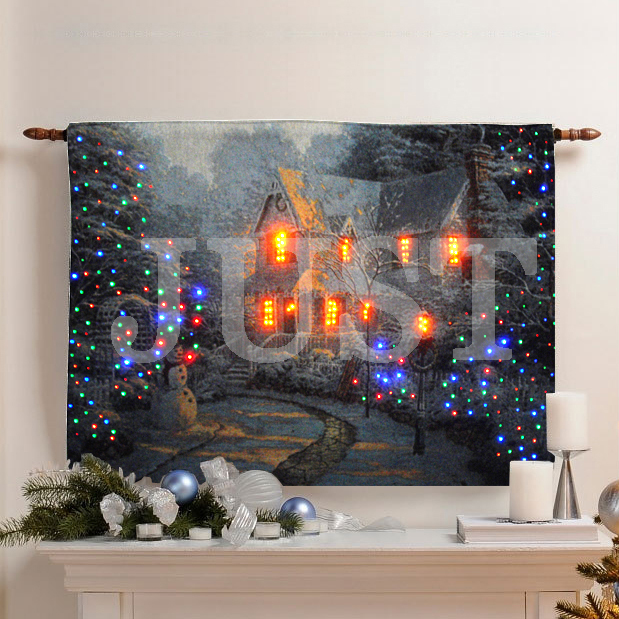 Fiber-Optic Wall Tapestry Believe in the magic of the holidays and celebrate the season. The fiber optics are placed in a pattern to complement the image. Light up the season with this wall decor! It comes with a wooden dowel rod for easy display. Quality made by Manual Weavers with fiber optical lights woven in. Battery powered (not included).Twinkling fiber-optic lights on the winter scene Keep it up all year; just flip it back and forth for the season Use on/off switch or timer Built-in timer runs for 6 hours then turns off for 18 hours Cycle automatically repeats every 24 hours.Battery-operated,no need for unsightly power cords. 1.No need for unsightly power cords. 2.No frame .stretch on wood box by your self. 2.Remote control on and off so you can hang it anywhere. 3.Wall Hanging requires AA batteries, not included. Remote includes battery. 4.Hanging rod, finials and hanging hardware included.